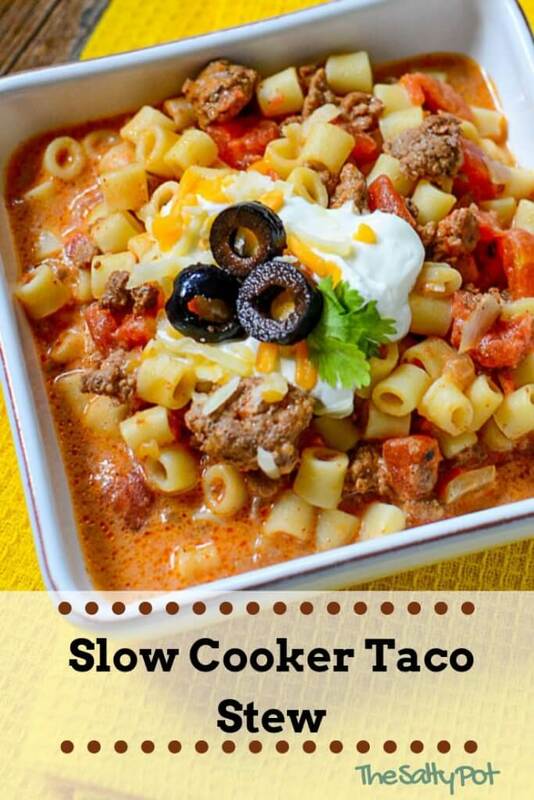 Ever heard of Slow Cooker Taco Stew? Me neither until I made it. I’m not saying I invented it… as I’m pretty darn sure that unless you’re a wacky high-end chef, using wacky, far-out ingredients, there’s not a lot of “never made before” recipes out there. But.. I could be wrong. With this Taco Stew, if I was a betting gal, I wouldn’t place any money on the fact that this recipe idea is new. Having said that, it’s new to me, and it’s incredibly delicious, and that’s all that matters!! It came about with a craving. Mmmmmmmmm… “Mexican Flavors” one part of my head was saying. “But I don’t have any tortillas.. or even taco shells in the house”.. the other part of my head was saying. “Make it work,” a voice in my head said. “And make it delicious”. So I listened. 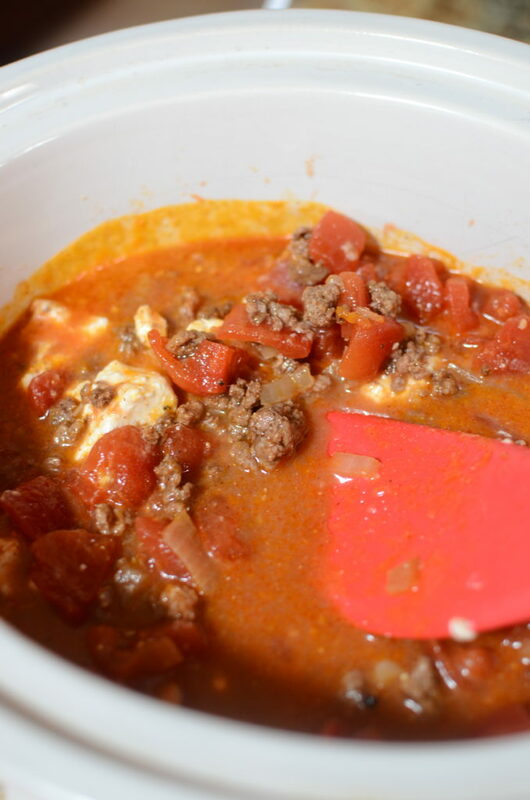 Regardless of the consistency dilemma, let me re-iterate again – this taco stew concoction is plainly DELICIOUS!!. If you like Mexican flavors, you WILL… LOVE… THIS………….. STEW. No fancy ingredients. In fact, I’ll bet you have all the stuff you’ll need in the pantry right at this moment. Beef, tomatoes, onion, seasonings, cream cheese, pasta, broth, and then garnishes! Seriously, this is crazy easy to make. Best of all, it’s done in the slow cooker (or crock pot, which ever term you call it) – so no having to watch it at the stove so it doesn’t boil over. I seriously have SO many incredibly important things going on at alllll times of the day.. I just don’t have time to sit and watch and stir!!!! lol… ok, truthfully, I’m simply just lazy, so that’s why I like… no, LOVE, my crock pot. I throw it all in, stir it up, and walk away! What’s not to love about that???? 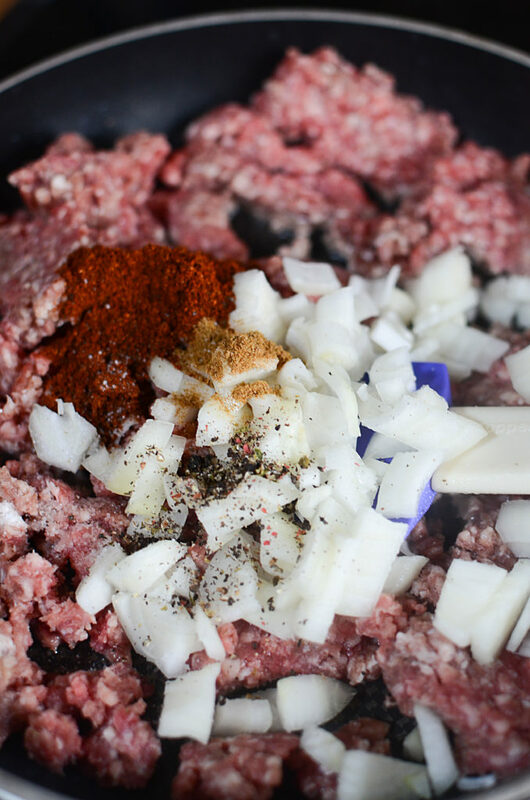 You will want to brown the burger first only so you can drain the fat and well, I know that you know that browning meat (and onions) creates a much more flavorful dish in a slow cooker. It’s just one of the laws of Flavor Town and if we want to go there, we just have to do these things, ya know?? Brown the burger with the onions, and add the seasonings. If you would rather use Taco Seasoning instead of the chili powder and cumin, awesome! Go ahead! But, let me tell you something.. click Here and you can make your own!! Seriously, it’s waaay cheaper, you know what’s in it, and well… you made it yourself, so how cool is that??? Add the cooked burger mixture to the slow cooker. Add the rest of the ingredients (except the pasta of course), and let it go! Cook on high.. cook low… do whatever suits you and your schedule! 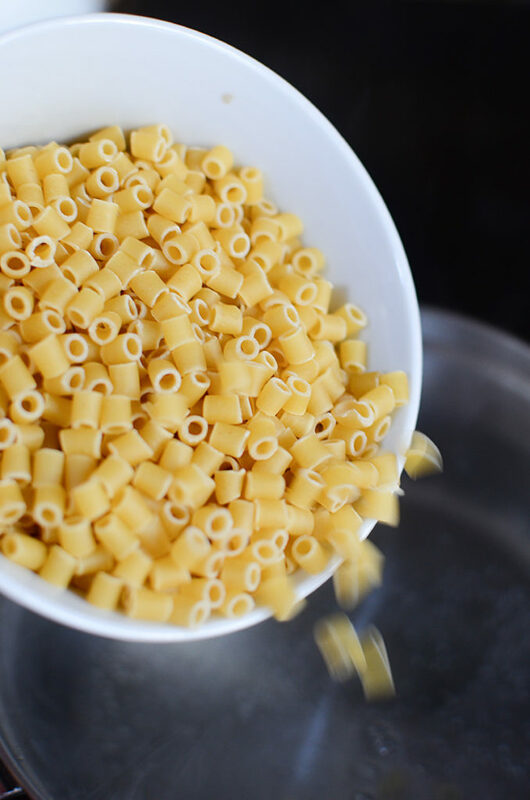 Cook the pasta shortly before serving, drain, add to the stew, give it a mixup, and you’re ready to garnish! It’s really that simple. Again, this taco stew isn’t a brand new recipe invention. But you could sit outside at the patio table with your family while you eat it, and let the incredibly tantalizing scent waft over to Ms. Snobby Neighbor’s place. She’ll wonder how is it that you’re so amazing to make your own slow cooker taco stew with your very own taco seasoning spice blend. She might even think you invented the recipe…. and you know what? I think you should let her! 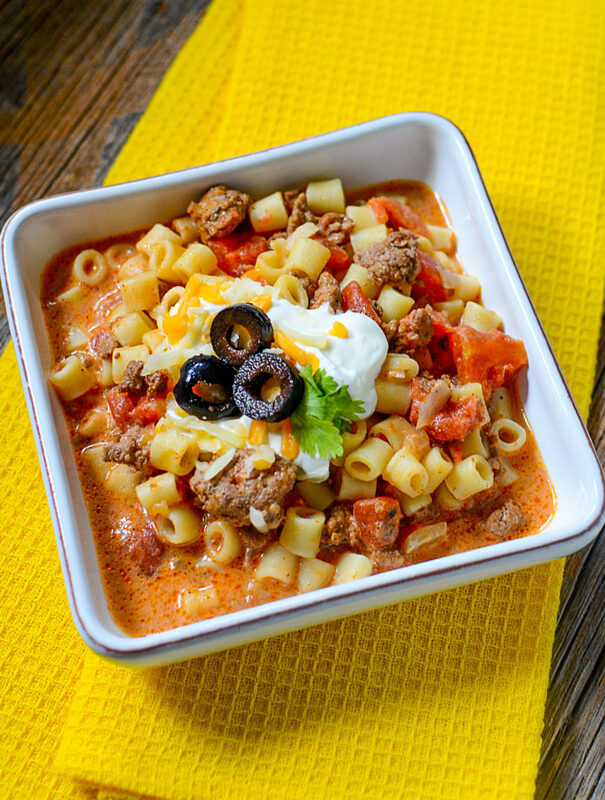 This Slow Cooker Taco Stew is not only delicious, but it's excellent at stretching that grocery dollar! 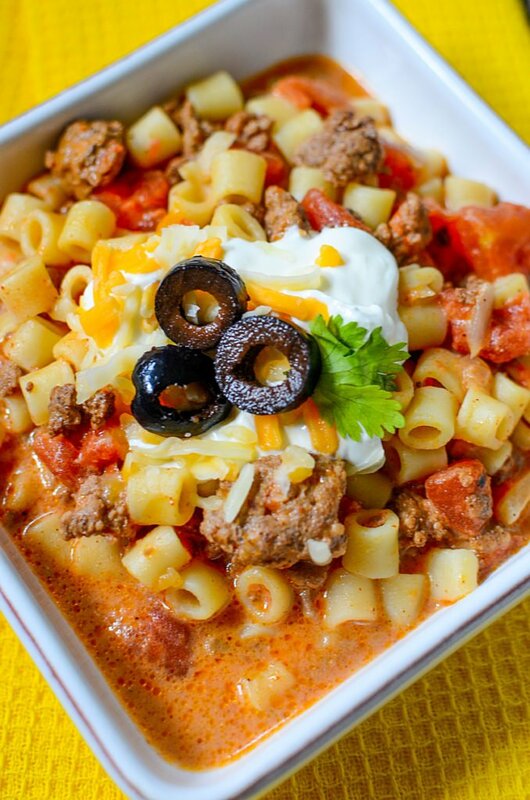 The pasta makes it hearty and comforting, the beef is a healthy and frugal ingredient, and the taco flavors are sure to hit the spot! In a pan, brown the beef. While browning, add the onion powder, garlic, chili, cumin and salt and pepper. 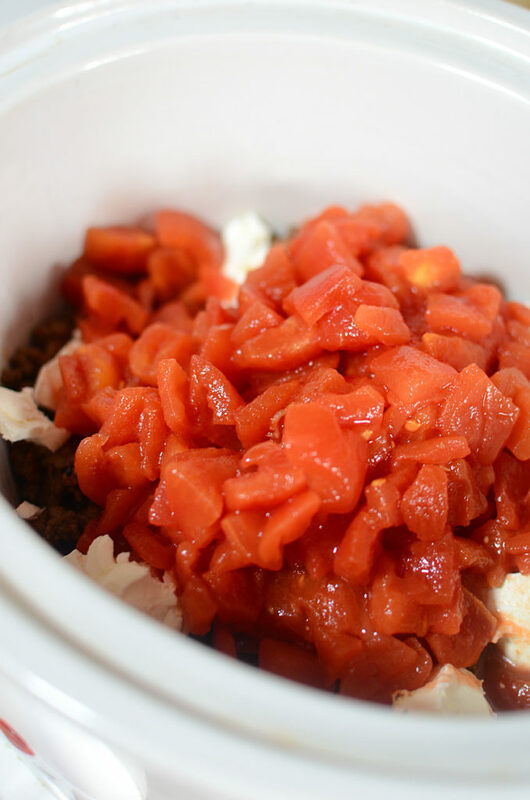 Add the beef broth, cream cheese, green chilies and canned tomatoes. Cook on low for 4-5 hours, high for 2 – 3. In the last half hour of cooking, cook the pasta stovetop, drain, and then add to the stew. On serving, garnish with any of the listed ingredients you wish. what is the name of the pasta that you used in this recipe? Is there any way to cook pasta along with the soup? Would be nice to have one pot! I don’t see why you couldn’t. I would just be sure to add enough extra liquid for the pasta. My only reservation is that I would be sure to be around when I added the pasta. Pasta doesn’t have a shut off cooking time, so if you’re not home, it will keep absorbing liquid, get mushy, and possibly dry out the stew…. I don’t see the taco seasoning that you mentioned in blog listed in recipe. I made it and it was great without it but wondering if it would be even better with it? And real onions instead of onion powder? Great recipe! Does this have to be made in slow cooker? What’s the benefit of slow cooking? Hi Kelly!! Thanks for asking! It certainly does not have to made in the slow cooker. You can make it on the stove top for sure! The benefit of the slow cooking is that you can leave the dish cooking low and slow, so that you’re not tied to the kitchen if cooking on the stove top (frees you up to be able to do other things for a few hours), and the “low and slow” method really helps to develop the flavors! When do you add the cream cheese? It says add the rest of the ingredients when you’re explaining, but in the recipe it doesn’t mention the cream cheese. I want to make now, but not sure if the cream cheese will curdle cooking that long. It only states in the last 1/2 hour to add the pasta(I was thinking maybe then add the cream cheese??). Hope someone answers. Thanks! Hi Dianne!! I added the cream cheese from the beginning. I broke it into smaller pieces and just kind of “dotted” the dish with them. I had no problems of curdling. Let me know how it goes for you!!! Hi! I did just like you, in the beginning & broke the cream cheese into little pieces. It was delicious! We all loved it and I will make it again. Thank you for a tasty, delicious recipe! OH Dianne! I’m so happy you enjoyed it! I have to say, it’s one of my favorite recipes I’ve made on this blog. 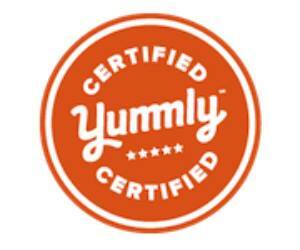 It’s just SO tasty, and with the pasta in it, it appeals to little ones as well! That makes my day! I am sure going to try this. But I think I will break up some lasagna noodles to use. And add them raw so will probably need to add extra water. I am even lazier or busier than you whatever the case may be. That’s a great idea June! And I’m quite sure that you’re not lazy!! If you were lazy, you wouldn’t eve bother to make this!! 🙂 Please let us know how it turned out with the lasagna noodles! You mentioned, at the end of the instructions, about adding the soup. What soup???? It was supposed to read STEW. It was a typo.